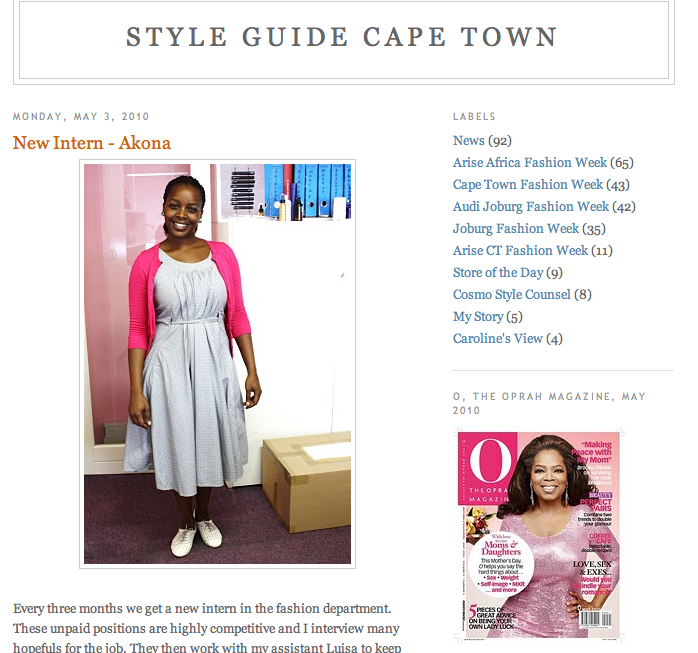 Ladies and gentlemen, please look under your seats….. taa daa, O Magazine’s new fashion intern!!!! So I’ve changed my mind about advertising and on the mission to find what it is I’d really like to do, first step; try something new! Thanks to an amazing and inspiring woman, Robyn,for the next 3 months I will be interning at O magazine, working with Robyn Cooke (O mag Fashion Editor) and her assistant (ex intern) Luisa Rodriguez. Dynamic duo they are, with a love for fashion and communication – the next 3 months are going to be great. The first week was fantastic, although I had moments of feeling absolutely clueless, which I guess is okay because I am here to learn, and learn I will. So far I’m learning about the ins and outs of making the fashion pages of O mag come to life, behind the scenes, relationship management with suppliers/clients/designers, what style and fashion really is and so much more. Fashion ignorance will be a thing of the past for me. I will share more as each week passes, for now, wish me luck!